My last "day off" - when I wasn't working - before Chie and Erika came back from Japan. Should perhaps have done something more ambitious with the rare burst of completely free time but couldn't really think of anything, so just spent the day mooching around at home and nearby. Popped out for both breakfast and lunch, but spend the rest of the day indoors. Since the utterly lovely day out we had in September visiting Nyetimber I'd been really keen to get back down to West Sussex again. Partly just to linger a little longer in the wonderful Rising Sun in Nutbourne, but also to do what we hadn't quite managed to fit in on our last trip - a visit to Nutbourne Vineyards, which lies inbetween the village of Nutbourne and Nyetimber's vineyards. So today I thought I'd take advantage of my copious free time while Chie and Erika were still in Japan and do just that. I got a relatively train out of Victoria in the morning, and was in Pulborough by 11:30, ready to retrace our steps from there to Nutbourne. I managed the walk a bit quicker this time round, as I was by myself and already knew where I was going, although the last little bit across the fields before Nutbourne this time was a bit more challenging as there were electric fences across the public footpath! I did my best to go round, but did eventually have to duck under one, which was a tad unnerving. I arrived at the Rising Sun around 12:15, and having originally planned to just linger there I actually had a fairly quick lunch, thinking I might be able to get to the vineyard and back in time before they closed for the afternoon at 3pm. Back in September we'd managed to take a wrong turn not long after leaving Nyetimber, and instead of walking through Nutbourne vineyards as we should have done, we ended up having to clamber over fences and tramp across some fields. This time I figured out where we'd gone wrong, and it seemed almost embarassingly obvious - where we'd taken that wrong turn we were in fact only 10 metres or so away from one corner of Nutborne Vineyards. Ho hum! On arrival at Nutbourne Vineyards I got a message from Natalie, a friend from work, who had initially expressed interest in coming along again (having joined us last time in September) but had apparently overslept, so I thought was going to give it a miss this time. To my surprise though she actually seemed quite determined to come anyway. So I killed time for an hour or so wandering around the vineyards which, was very pleasant in the crisp Autumn air, and the ground littered with golden brown leaves from the vines and surrounding trees. Natalie arrived around 2:30 and we went and did a tasting of Nutbourne's wines in the former windmill they happen to have on the site, which made for a lovely venue - albeit a bit cold! We sampled quite a few wines from Nutbourne's range, but the standouts for me were the sparkling wines - their "Nutty" range - perhaps not the most sophisticated name, but the wines themselves are definitely very sophisticated. They follow the methode champenoise as far as I could tell, and the composition of grapes is similar - mostly Pinot Noir and Chardonnay - but instead of Pinot Meunier they use some Reichensteiner, a German grape which was one of the more typically grown grapes in England prior to the recent dominance of the three Champagne varieties. We also did a brief tour of the winery - something which was off limits at Nyetimber - and particularly excitingly got to watch them disgorging their sparkling wines prior to second fermentation. This is the process where, to remove sediment from the yeast from the first fermentation, they upend the bottles, freeze the necks, then pull out a sort of icy plug containing all the solidified sediment. The weather had mostly been rather grey and overcast, but in our final few minutes at Nutbourne vineyards the skies cleared a little, and we had some lovely golden views of it as we were leaving. We'd hoped the rumours of the Rising Sun closing in the afternoon might have been greatly exaggerated but they turned out to be quite true. So instead on the way back to Pulborough station we stopped off at the White Horse for a quick drink, and to warm ourselves by the fire. We'd turned our noses up at this pub from the outside on the previous trip, and I'm glad we gave it the benefit of the doubt this time, as it's actually quite nice inside - they use empty Nyetimber bottles for candle holders, which the landlord quipped was simply a result of the amount of the stuff they get through there! As seems to be becoming the tradition, we had chips on the train from the fish and chip shop next to Pulborough on the way back. 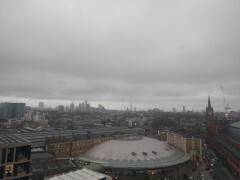 After arriving back in London, Natalie went off to see some friends near Victoria, and I decided to pop by the office in King's Cross to see if I'd be able to see any fireworks from the roof terrace, it being November 5th. When I got there I realised quite a few other people had had the same idea! I was able to see quite a few firework displays, mostly over towards East London, but they were all a bit too far away to get a decent picture of. Still a nice way to round off the day nonetheless. Andrew from work has lived in Deptford for a couple of years now, but has never painted a particularly rosy picture of it, so that added to the fact it's a bit of a trek from central London meant I'd never really been particularly keen on the idea of going down there. However earlier this week he'd mentioned there was a new hipster bar which had just opened there, and given my current copious supply of free time I'd called his bluff and asked him when we were going there. Everything about the bar in question sounded Hackneyed (note the deliberate capitalisation to underline both interpretations of that adjective there) but we were all quite comfortable with the idea of attempting to pretend to enjoy it in a post modern ironic way, or however it is hipsters come to terms with this sort of thing. The theme was kitsch 1980s chintz mixed with lots of temporally appropriate pop culture references, and in particular numerous tips of the hat to characters from Eastenders during that era. The staff were actually very pleasant and welcoming, which left me confused as to whether this was indeed an instance of the usual dispassionate aesthetic parasitism typically associated with all things hipster, or whether the same apparent end result had been reached by some genuine warm hearted nostalgia. It's of course impossible to tell. The drinks were of course served in teapots, a gimmick which we initially reacted to with ennui, but the cynicism of our group universally melted on discovering there was a teapot shaped like a dog. As an added surprise, amongst their collection of assorted teacups to serve the drinks in, they had a Noritake cup exactly like the set I have at home, "inherited" from Mum and Dad, and something I rather treasure. So actually I felt a slight affront at seeing it in amongst the other naff / chintzy old 1970s / 1980s teacups, as I think the Noritake set is rather elegant. The food offerings - mostly deep fried as far as I could ascertain - had an almost Proustian quality, amplified by the constant lingering of the smell of a domestic deep fat frier in the air - somehow not the same fragrance as a large scale commercial deep fat frier. It's been many years since I've been in the presence of a domestic deep fat frier. It's hard to say I've really been to Deptford still, as the bar was only two steps outside the entrance to the station, but I did at least - despite all the odds - enjoy this place. Went to the Bree Louise with Al and Kyle this evening. Although I do quite like the pub - mainly for its cider selection - it occurred to me this evening it wasn't really a particularly good venue in which to try and have a conversation. After a pint or two there, we decided dinner would be a good idea, and opted for a nearby Italian restaurant of the cheap and cheerful variety. Third day in the new office in King's Cross. Took more of basically the same photos from the balcony. In the evening I couldn't be bothered to cook, particularly as I still hadn't done the washing up yet from last night (pretty much the only day this week I had been bothered to cook). So I went home first, did the washing up, then headed back out again for some Thai food at the Pineapple. Second day working from the new office in King's Cross. Went to Waitrose on the way home, thinking I should actually buy some groceries and make an effort to cook for a change - being by myself at home this week it was all too easy to fall into the habit of eating out or getting takeaway every night. I wanted some kind of vegetarian equivalent of steak and chips - so found some Quorn "steaks" and some potatoes. The potatoes came out quite well - little new potatoes which I boiled for a bit then roasted for a while in the oven. Also had some cavolo nero which was quite nice. First day officially working from new office in King's Cross - I had packed my desk up before I went off to Italy, and my things had been moved in crates while I was away. Of course it wasn't the first time to see the new office, some people having moved across earlier in the year, so I had already popped in a few times... but it was the first time to have all the floors fully occupied, and as of today I was officially based here. I predicted the slight feeling of alienation I always seem to get when a big change like this occurs, some combination of being in a new flashy environment and being surrounded by lots of people I don't know (people had moved from various different offices in London into this one). So I went to work forearmed, wearing a tweed suit, which helped to insulate me from that. At the end of the day I thought it appropriate to toast the new office with some of the usual suspects, and also wanted to give the walk home a go, so I managed to somehow combine the two, and persuaded a few people to come and join me at a pub called the Constitution, which is along the canal towpath that forms part of one potential walking route between home and the office. It's a funny sort of pub, seems to be a mixture of slightly rough around the edges locals and hipsters (which is an odd thing in itself for Camden)... but I imagine the beer garden with its canalside setting will be very pleasant in summer. I'm not sure everybody else particularly wanted to linger much longer, most people I know seem to have quite negative feelings toward Camden, and it was a dark, cold Monday evening when it was quite forgivable that anyone would rather be at home in the warm. Ricardo's girlfriend Catherine had, I got the impression, come to the pub in order to retrieve him in the not unreasonable expectation they might spend the remainder of the evening together - particularly as I'd also occupied rather a lot of his time on Saturday afternoon in Hampstead. ...but if it indeed was the case Ricardo certainly did not detect those signals! So anyway somehow I roped them in to joining me for dinner, which based on no other reason than we happened to be nearby was at a Greek restaurant in Camden called Daphne's. I thought I had been there something like 15 years ago, when I first lived in London, with Chie's friend Junchan, but the interior wasn't quite how I remembered it, so it may actually have been one of the other Greek restaurants nearby - there does seem to be a little cluster here. I quite enjoyed the food this evening, and particularly liked the fact I recognised almost none of the names of the dishes on the specials board. I had sent Al a message the day before to see if he was free for lunch, he replied that they were planning on having lunch with Kyle and Hannah and he was sure they wouldn't mind if I joined them all. I'd just assumed they were going to a pub or something, but by the time it had got to the point of being too awkward to back out it emerged they were actually eating at Kyle and Hannah's place. It's one thing to gatecrash some friends going out for a meal, but it felt particularly rude to have effectively invited myself round to their house, albeit that I did not realise that was what I had become embroiled in at the outset. To make matters worse I arrived slightly early - thanks to the timing of the trains it was a choice between that and half an hour late. I subsequently inferred that the timing of the invitation was probably set such that they could get Ralph down for a nap before everyone arrived, which I of course then disrupted. His exasperation at the disturbance to his routine was exacerbated by the disappointment he then experienced when he thought "Oh, Erika's Daddy's here... but where's Erika?". Add to all of that the usual awkwardness of me being vegetarian, and therefore them having to make an extra dish specially for me and I felt like the worst guest ever. At least I didn't break anything. I felt rather detached throughout lunch, perhaps partly in reaction to having to re-adjust to the mundane themes of day-to-day life after my week of carefree gallivanting around Italy - and it can be quite irksome to have to listen to a full account of someone else's holiday so I did my best to keep it brief when asked about it. Instead the conversation seemed to mostly cover buying houses, building work and cars, and I didn't feel I had much to contribute on any of these topics. Not long after lunch I made my excuses and got ready to leave, thinking the rest of them might be a bit more relaxed on this occasion without the interloper who didn't have much to say for himself, but this then prompted Al to decide it was time for them to leave too, so to add to my list de faux pas for the day I'd also caused the party to end prematurely. What a terrible guest! Once back in Kentish Town I popped into the Pineapple for a bit, hoping somehow this might help me to re-acclimatise with normality. I got talking to the resident pub bore, and actually had a fairly interesting conversation, as it turned out he had lived for a while in the village where I grew up. It's a small world. Odd also that, at least on this occasion, I felt more relaxed talking to a complete stranger than with good friends who I had known the best part of a decade. Headed back home before dinner time, and rather lazily ordered Indian food for dinner. Had considered going down to West Sussex today, but hadn't quite got my act together in time, and also thought, on reflection, that after spending at least 4 hours travelling by train every day for the last four days (and over 8 yesterday) I could probably do with a day without any trains. In the morning I thought I'd tackle the hedge, which probably was due for a trim about a month ago, but I hadn't quite got around to. It had got particularly high, such that I thought I ought to go out and buy step ladder to do it properly. That felt very grown up. Ricardo had mentioned he was planning on heading to Hampstead for a pub lunch, and that sounded like a nice plan - particularly as I could get all the way there entirely on foot. So, a little after midday, I set out in the direction of the heath, and had a pleasant stroll taking in the views of London from Parliament Hill as I went. Met Ricardo his friend Milo at the Holly Bush, where we had lunch sat around a table which wasn't really big enough for the three of us, squeezed into a corner between two other tables. I generally like the food at the Holly Bush, but on this occasion I found the dish I chose a bit weird, it couldn't quite decide whether it was trying to be European or Asian and I don't think it really worked as either. Conversations with Ricardo tend to be on the eclectic side and I don't recall any single particular theme. I recounted the very differing standards of hygiene between me and my Dad that I'd obsrved during our week in Italy, particularly the chocolate bar incident - and that seemed to recur a bit throughout the day. Perhaps the excerpt I found most amusing though was when I was talking about how much I like salty food, and how I theorised it came from the fact I grew up in - at which point Milo interjected - "a salt mine?". Ricardo also found this quite amusing, but unfortunately was mid way through chewing on his gnocchi, upon which he then began to choke instead. After lunch the three of us took a stroll back over the Heath and, in the absence of any other plan I proposed heading to the Southampton Arms, where we were also met my Ricardo's other half Catherine. I was pleased to see her, as I'd heard she happened to know the parents of one of Erika's friends, who we'd recently found out are from a particularly interesting aristocratic background, and I was fascinated to learn a bit more about them. From there we also went along to the Pineapple for a final drink, after which I bade them all adieu - Ricardo had very kindly invited me to join them at the Halloween party they were going to later, but I decided I'd done enough for one day, was still a bit tired from the long journey yesterday so I left them to it. We were booked on the 07:39 TGV from Turin to Paris, so a bit of an early start this morning. Dad apparently had barely slept at all for fear of oversleeping and missing the train, and they left the apartment at something like 6:30 - just as I was getting up - I left at just after 7 and met them at the station. The first leg of the return journey actually went really well. Dad had wanted to see the snowy Alps, and it had been too dark on the way here, plus too hazy to see them while we were in Turin. This morning though the skies were clear, and we had nice views of the mountains as we passed through. So this was all quite pleasant, and more or less ran to time. From Paris things went a bit downhill though. Our train arrived at Gare de Lyon around 1:20, I had planned to have lunch in Au Train de Vie near Gare du Nord but by the time we had faffed a bit and got an Uber, we arrived at the cafe at 2:05 - just as they stopped serving lunch. I had been there at various times of the day on previous trips, sometimes to eat, sometimes just for a drink, but I guess it hadn't really occurred to me that the kitchen was only open around the very regimented French notion of mealtimes. I did attempt to advocate that we still sit there and at least have a coffee regardless, but Dad didn't want to for some reason - despite my protestations that there really isn't anything else very nice around Gare du Nord, and there's nowhere to sit down inside the station itself. So we then had to go and learn that lesson in real time - and ended up in a generic cafe opposite the station which obviously thrives on exploiting tourists, and charged 8 Euros for a Diet Coke. It was a slog getting through security onto the Eurostar, some part of the process seemed to be short staffed, and we spent longer than the recommended 30 minutes getting from check in to the actual train. Frustratingly the train then sat at the platform for quite some time past its scheduled departure. It became clear en route that Dad and Janie weren't going to make their onward connection in London back to Devon which was the cause of some consternation thanks to the inflexibility of Advance purchased tickets. I did try to provide reassurance that there's a process for this - if you miss a train because of a delay on another train, you get the first train company to give you a stamp, then the other company are required to let you take a later train. On arrival at St. Pancras Dad and Janie got in a taxi, which apparently got them to Paddington just as their original train was pulling out of the station. They were able to use their ticket on the next train without incident though, and probably having a bit of a break at Paddington was for the best anyway. I also got a taxi back home, as my suitcase was rather heavily loaded with bottles etc. Having eaten exclusively Italian food for the past week I had been musing over what I might eat on my return - probably not a bowl of pasta. I decided instead to get a Chinese takeaway, and as I happened to get there at one of the busiest times of the week for them, while I was waiting for them to cook it I popped into the Pineapple for a quick pint as a welcome back to England.